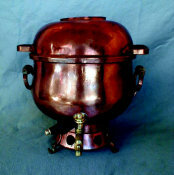 Bronze Samovar. 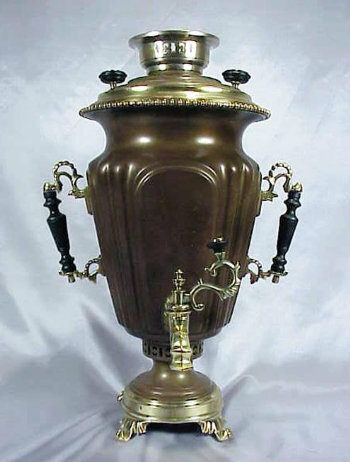 Elegant and rare this beautiful bronze samovar has a rich dark chocolate original patina relieved to bronze on upper rim, base, handles and spigot. 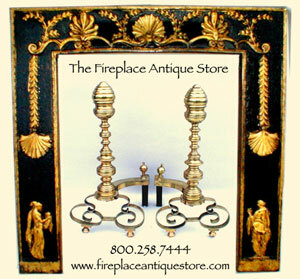 Conical shape with double paneled and fluted body sits atop a circular base with finely detailed stylized slipper feet. Beaded upper rim and ornate folkloric handles. Nickel crown. 2 sets of 2 Medallions and Award seals for years 1878/9 and 1888/9. Dimensions: H 20" W 13"